When we joined Pinterest we had a goal of getting to 1,000 followers, and we’re on our way. (You can check our progress here)… That’s an admirable goal, right? But how about 500,000 followers? Clearly it’s possible. 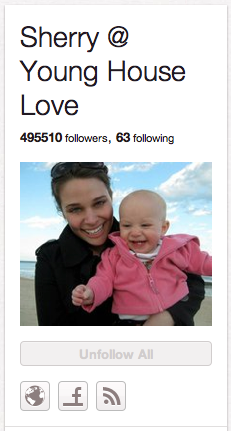 Case-in-point: Sherry@YoungHouseLove, (click here to see her current number of followers). So how did she do it? Obviously she’s an exception, not the rule, but let’s look at how she did it. 1. Leverage Your Existing Social Media Traffic To “Jump Start” your Pinterest Efforts. In her case, Sherry & her husband have a massively successful blog related to home decorating. They started it in 2007, and developed a Big following. You can see their blog stats here. But just because she had a big following doesn’t mean she didn’t need to extend an invitation to her followers. See how she did it, (here). If you’re not blessed with a massive social media following, focused on house DIY projects, don’t give up. But do learn from the lesson – use your existing social media options to drive traffic to your Pinterest profile. 2. Operate In A Narrow Theme. Sherry has 7 pinboards, in a very tightly narrowed range of topics. In essence, she’s staying in her ‘wheel-house’. Your niche is your niche -own it, obsess over it, go deep into it. This strategy is definitely a ‘quality’ over ‘quantity’ approach, and obviously that approach is the right one for a Pinterest audience. Be a visual curator. If you’re not sure how to do that, read this post. 3. Contests! Sherry has done a great job of holding contests in Pinterest. Can you conduct a contest using Pinterest? If so, you’ll generate a massive social splash as your contestant’s entries go viral. 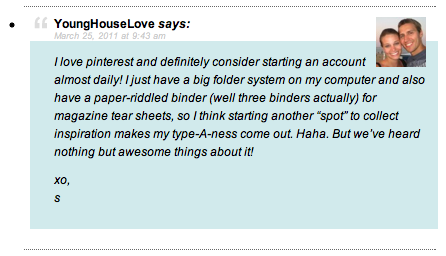 Want to learn more about how Young House Love has built a successful blogging business? They’ve got a nice collection of posts available, (here). Is 500,000 realistic for you? Maybe, maybe not! But regardless, there are good lessons to be learned from the Pinterest Heavyweights!